I love THE LAST SEDUCTION - not that I'd fly to Santa Fe this month to see it on the big screen. I look forward to seeing it on your schedule eventually. It's a good thing I live too far away to attend, or else I'd annoy everyone else in the theater by quoting the entirety of Aliens. I pre-ordered the book back in July from Barnes and Noble for my Nook; can't wait to have it downloaded tomorrow. They did not release the pre-ordered eBooks early like Amazon did. Looking forward to getting it tomorrow and reading about.....DRAGONS! Looking forward to the Princess and the Queen! Especially, if it's 'entire' version as part of the 'GRRM-allion' . I haven't picked up or read any of the Warriors anthologies...I would like to do so someday. I know a Dunk and Egg story appeared in one (or two? ), but even the ones that don't have a story by you interest me. Are you referring to one of the HBO versions of the Sigil. The one displayed in the books is entirely different and more midieval looking (as are most of them) but I don't know as GRRM actually designed those either or if they were just an artist's interpretation of the description from the book. In either case I don't think any similarity was deliberate but I could always be wrong. Sometimes writers influence changes when they go to tv and film so i was wondering if this change had to do with Asha being heir. Eagerly anticipating the book release. Very excited to learn about the history of the dance with dragons. That's a bummer about The Last Seduction. I love that movie. Linda Fiorentino at her snarky, sociopathic best. 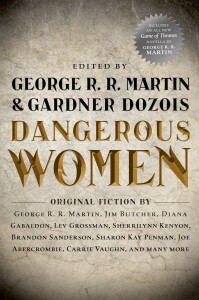 Will this be the only signing for Dangerous Women? Might you have any signed copies available for purchase after the event? I'm really impressed with the selections for Dangerous Women. I've already read them all and they are so good! I will totally be checking out some of the works from the Authors I've never read before (Holland and Abercrombie). I Was especially impressed with the Eleanor of Castile story. It felt very similar to reading ASOIAF - but with real history! I love Coffy! Just anything with Pam Grier in it is awesome!Shame Sante Fe is just a tad of a commute from DC. Aliens...one of the scariest movies I've even seen. Great stuff. Oh..and Joan Bennett looks pretty hot there. I remember when she was a tad bit older in the old Dark Shadows soap opera. Pam Grier and Sigourney Weaver a two of my faves. Makes me wish I was living in your town. I enjoyed reading THE PRINCESS AND THE QUEEN, it was great. I do have a few questions (if at any time you would like to answer them it would be great). Will we have more information on the Targaryen family tree? Such as who was Rhaena Targaryen, the one that rode Dreamfyre before Helaena Targaryen, not the daughter of Daemon Targaryen? And who was Aemon Targaryen, the father of Rhaenys Targaryen? In essence will we have a complete Targaryen family tree? Another question would be if we are going to have the story told in full and the mysteries revealed? The way Aegon the Younger gets the Iron Throne, who was the friend of Daemon Targaryen on the green council, the duel between the twins on the Kingsguard, Erryk and Arryk, and so on. Thank you for a great, GREAT read and an amazing way of giving much needed information on the complex Ice and Fire universe. Some of these questions will be answered in the forthcoming WORLD OF ICE & FIRE. Others may need to wait for the eventual GRRMarillion, a large chunk of which will be the full, unabridged 80,000 word history of the Dance of the Dragons. Lots and lots had to be left out in the novella as published in DW. But I am very pleased that you enjoyed my fake history. From reading all your posts on here I get the feeling that TpatQ was fun for you to write. When you don't have the pressure of untying the Meereenese Knot do you get more enjoyment out of writing and therefore are able to produce more words? Next year I'm definitely looking forward The World of Ice and Fire, The Dunk and Egg Collection, season 4 of the HBO series, and 'the Son of Kong' should he get unleashed. Either way, next year will be big for you! Any chance that we might get parts of this GRRMarillion earlier? I've heard that parts of may be stuff that would include spoilers for the main series. But surely you could take 'The Death of the Dragons' (that 80,000 words account on the Dance), 'The Sons of the Dragon' (the account on the reigns of Aenys and Maegor from which you already at a con) and the account on Aegon's Conquest and publish this along with whatever you have written on the reigns of Jaehaerys I and Viserys I as, say, 'The Days of the Dragons' of something like that. That would make a pretty big volume in itself already. There are really people out there who would want to get a look on the source material rather than the abridged versions we got in TPatQ (there was not really that much in there on 'the origins and causes' of the Dance, was it?) and will get in 'The World of Ice and Fire'. It's no secret that George is calling the book after The World of Ice and Fire 'The GRRMallion' (code name of course), and not counting the rest of Ice and Fire or Dunk and Egg. Would be neat if things that don't make it into Dunk, Ice and Fire, or the GRRMallion finds its way into an 'Unfinished Tales' type anthology...but there's a lot more to George than Ice and Fire and the Seven Kingdoms! I am curious what he'll do post-Dream of Spring. 1000 x this! I loved "The Princess and the Queen", but I am dying to read the whole story. Particularly since some signature events seem to be missing - Ser Arryk and Ser Erryk, a knight trying to go all Perseus on Syrax, etc. Nice to see Cocteau giving some love to Pam Grier. She was the best part of "The L Word" back in '04. Anyway, I've always had a soft-spot in my heart for the blacksploitation product. Next up, Pootie Tang? Loved the book George! It was great hearing more about the Targaryens. Also, I never thought we'd get so much Dragon action out of you, bringing in an old "Elder Dragon", Vhagar, was a nice touch. For people who can watch Coffy at the Jean Cocteau!! I unfortunately can't(live on a different continent) but Coffy is the best blaxploitation ever made and features a fantastic performance by Pam Grier. A true MUST-WATCH! !